Another two-parter today, albeit with the same side at the same tournament. In hosting the World Cup in 1998, France wore their classic tricolore look – paying homage to the 1984 European Championship-winning kit. This kit was used in qualifying from a group which included Denmark, Saudi Arabia and South Africa as well as the last-16 golden-goal win over Paraguay (which was a little bit overall-clashy). That meant a quarter-final tie with Italy, and an early example of what we have to know as FIFA’s preference for one-colour kits. 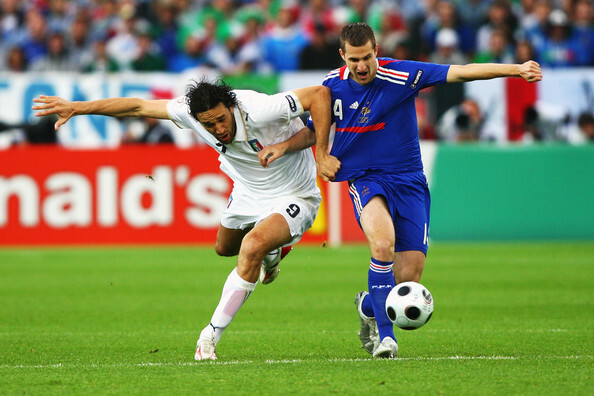 Though France were the hosts, Italy were the home team for the game but, rather than having blue-white-blue v white-blue-white, instead the Italians changed shorts to make an all-blue look while France wore their home shorts with their away shirts and socks. It’s difficult to make out from here, but a nice touch was that, instead of ‘F.F.F.’, the crest featured individual match details, in this instance ‘France Italie 03-07-98’. One penalty shootout win later and France were in the semi-finals, with surprise package Croatia the opposition after they had beaten Germany 3-0. Technically, there was only a shorts clash to deal with, but Croatia’s first-choice socks were blue. A sensible compromise was reached in that France switched shorts while Croatia wore white socks, creating plenty of distinction. Though Croatia went ahead, Lilian Thuram scored his only two France goals as they advanced and they were back in their traditional kit for the 3-0 win over Brazil in the final. Two years later, France would go on to hold the European Championship as well as the World Cup, beating Italy 2-1 in the final, wearing blue-blue-red as the Italians wore white. It was a look seen at Euro 2004 and World Cup 2006 too, but at Euro 2008 and World Cup 2010, they opted to bring blue change socks instead. Let’s just say they got what they deserved.